There is an inspiring story in the Kath Upanishad about a little boy named Nachiketa. He was the son of Udalak rishi. Once Udalak organized a yagna to please the deities. It was customary in those days to donate cows to Brahmins at the end of the yagna. Udalak was a miser and he donated old and weak cows to the Brahmins. None of the cows yielded any milk. This disturbed Nachiketa. He asked his father about it, "Father, to whom would you give me in charity?" This made his father very angry, but he decided not to say anything. When Nachiketa repeated the question, Udalak lost his temper and said, "I give you to Yama." Yama is the king of Yamapuri-hell. Hearing this Nachiketa went to Yama's kingdom. It was his father's command. It would not be proper for him to disobey his father. 'I should fulfil his wish,' thought Nachiketa, even if it means leaving home. However his father realized his mistake and tried to stop him but Nachiketa did not stop. He reached Yama's kingdom and was told by Yama's guards that he had gone out for three days. Nachiketa decided to wait at his doorstep till he returned . He waited for three days. No food, no water. Three fasts ! Yama returned on the fourth day and saw little Nachiketa at his doorstep. He felt pained for keeping a Brahmin waiting without welcoming him, without food and water. It was a sin not to welcome an atithi -guest at the doorstep. He scolded his wife Yami for not welcoming him. Both rushed around the house to serve Nachiketa. One went to fetch water. The other brought a mat for him to sit on. Yama still did not feel completely satisfied in serving him. So he told Nachiketa, " Dear child, I have offended you by keeping you waiting for three days. To wash my sin I request you to ask for three boons." Nachiketa declared, "My first wish is, when I return home may my father welcome me lovingly. My second wish is to grant me the knowledge by which I can be worthy of living in the heavens. My third and last wish is to grant me Atmagnam -knowledge of the atma ." 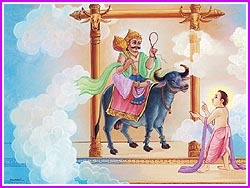 Yama granted the first two boons immediately and tried to convince Nachiketa to give up his third wish. He offered him gold, pearls, coins, horses elephants and even the happiness of Swarg -heaven instead. "No, I do not wish for anything else," replied Nachiketa firmly. Finally, Yama granted him the third boon too, and Nachiketa was enlighnered with the knowledge of the atma . Nachiketa inspires us to be kind to all creatures, to respect one's parents, to be strong willed to do something one has decided, even in the face of difficulties and obstacles and to seek for eternal happiness.